There are times when the rational world seems, if only for a second, to fall away. The leaves rustling in the trees on a still day. The movement just past the corner of your eye. We are taught to ignore the foolish impulse to react. But for those who look too long, too closely, there is another world pulsing just behind the façade of the one we know. Unimaginable things skitter by in the darkness, and sometimes they intrude on the reasonable, ordered world. They seep from the shadows, they rattle their chains and they force you to look. If you're lucky--very, very lucky--you'll survive what you see. But you'll never be the same again. This Free RPG Day exclusive quickstart for the World of Darkness contains everything you need to play through a scenario (except for some 10-sided dice). A separate file with just the preconstructed player characters is also provided. 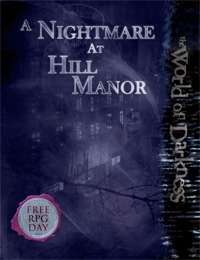 Just a little heads-up - your title here on OneBookShelf is "Nightmare on Hill Manor", but the actual book title is "A Nightmare at Hill Manor".